Roma, written and directed by Alfonso Cuarón, is being shown in cinemas across the U.S. — but for just a few weeks — before heading for Netflix streaming. 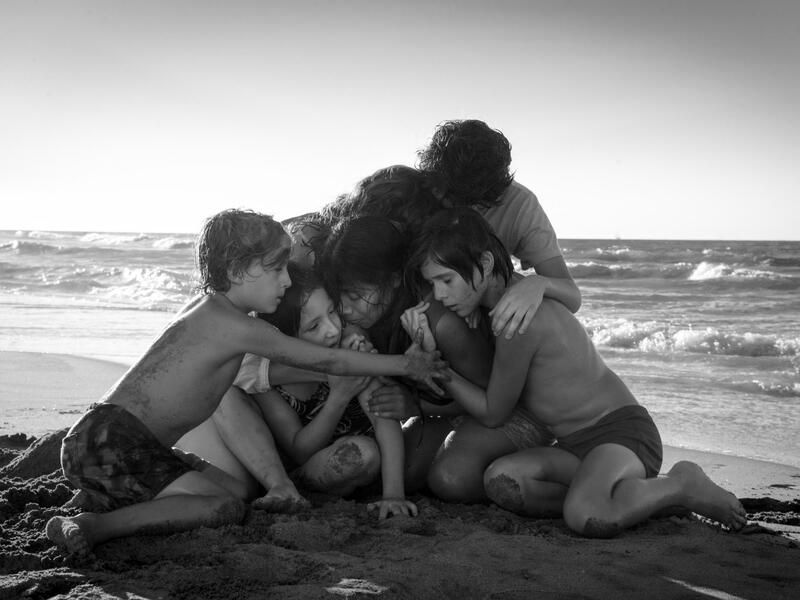 Roma is being called director Alfonso Cuarón's masterpiece. Epic black-and-white shots, stunning performances, and an artful story line have led to speculation about Oscar nominations. But behind the scenes, the film is part of a battle over who gets to premiere movies: streaming services like Netflix, or theaters? It's an increasingly common question in the film industry, and the stakes are high. For movie theaters, where attendance has been at a historic low, audience attraction and retention is key. For Netflix, once one of the few online streaming services around — but now just one of many — it's also a pressing issue. And for actors and directors, there's the question of the Academy Awards. Take the movie I, Tonya. Last year at the Toronto film festival, the filmmakers reportedly turned down Netflix. They wanted I, Tonya in theaters. The appeal of having audiences see your work in all its glory on the big screen is certainly huge. But Scott Feinberg, an awards columnist for The Hollywood Reporter, says, "The Oscars are about rewarding the best movies, not TV shows. So that means you have to have had at least what they call a qualifying run in theaters, in New York and LA." Allison Janney won best supporting actress for I, Tonya and Margot Robbie earned a best actress nomination. Industry insiders point to that as a turning point for Robbie's career. She soon became more of a household name, and tackled even meatier roles. An Oscar, or even a nomination, carries a lot of weight: It garners films more audience interest. The movie gets written into the history books. And it means more money and work opportunities for actors and directors. "Netflix's goal is to be a major production company that makes compelling content that is available exclusively on Netflix," says Michael Pachter, a media analyst at Wedbush Securities. As companies like Amazon and Apple increasingly stake their claim on the streaming service landscape, he says, Netflix's goal is "to give consumers a reason to sign up and stay as subscribers." In order to do this, Netflix needs to attract A-list talent. And A-list talent wants Oscars. Netflix has yet to get a best picture Oscar. To do so, it has to premiere its films in theaters. In other words, Netflix needs the movie theater, to kill the movie theater. Roma might be a chance to change all this. On the one hand, it's directed by Cuarón, an Oscar winner. But, as stunning as it is, it's subtitled, featuring unknown actors, and spoiler alert: no leather-clad Marvel superheroes. It's unlikely to be a blockbuster hit. Industry insiders say Cuarón needed Netflix to give Roma a wide streaming audience. "Suddenly his film can be seen right away, in 190 countries around the world, at a potential audience of 130 million people," says Joe Pichirallo, a former executive at Fox Searchlight Pictures and a professor at NYU. In a rare move, Netflix is showing the film first in cinemas across the U.S. — but for just a few weeks. "And Roma is now being taken seriously," says Pichirallo, "at least right at this stage. It's still early. But right now Roma is being talked about as a serious Oscar contender." Feinberg, from The Hollywood Reporter, says times are changing. "People are increasingly consuming movies in other ways, thanks not only to Netflix, but primarily to Netflix," he says. "You know, people love the convenience of being able to click a few buttons and watch from their couch." That might be so. But for the moment the way to win that best picture Oscar is still to show it on the big screen. The movie "Roma" is seen by critics as an Oscar-worthy masterpiece for director Alfonso Cuaron. But as NPR's Jasmine Garsd reports, behind the scenes, the film is part of a battle between streaming services, such as Netflix, and movie theaters. They're fighting over who gets to show the movies first. JASMINE GARSD, BYLINE: To premiere on the big screen or on a digital streaming service - that is the question. It's not a new one. Just last year at the Toronto Film Festival, the makers of "I, Tonya" were looking for distribution, and they reportedly turned down Netflix. Why - because they wanted "I, Tonya" in movie theaters, and they probably wanted to qualify for an Oscar, which actress Allison Janney won. ALLISON JANNEY: (As LaVona) I didn't stay home making apple brown betties. No, I made you a champion knowing you'd hate me for it. That's the sacrifice a mother makes. GARSD: Scott Feinberg, an awards columnist for The Hollywood Reporter, explains. SCOTT FEINBERG: The Oscars are about rewarding the best movies, not TV shows. So that means you have to have had at least what they call a qualifying run in theaters in New York and LA. GARSD: That little golden statuette carries a lot of weight. You get more audience interest, more money, more work opportunities, and your film gets written into the history books. And all this presents a conundrum for Netflix as it tries to stand out among a growing number of streaming services. Michael Pachter is a media analyst at Wedbush Securities. MICHAEL PACHTER: Netflix's goal is to be a major production company that makes compelling content that is available exclusively on Netflix to give consumers a reason to sign up and stay as subscribers. GARSD: In order to do this, Netflix needs to attract A-list talent, and they want Oscars. Netflix has yet to get a best picture Oscar. To do so, it has to premiere its films in theaters. In other words, Netflix needs the movie theater to kill the movie theater. The new movie "Roma" might be a chance to change all this. GARSD: On the one hand, it's directed by Oscar award winner Alfonso Cuaron. But it's also in black and white, in Spanish with subtitles and with unknown actors, unlikely to be a blockbuster. So Cuaron needed Netflix. Joe Pichirallo, a former executive at Fox Searchlight Pictures, says Netflix can give this movie a wide streaming audience. JOE PICHIRALLO: Suddenly his film can be seen right away in 190 countries around the world at a potential audience of 130 million people. GARSD: In a rare move, Netflix is showing the film first in cinemas nationwide and just for a few weeks. PICHIRALLO: And "Roma" is now being taken seriously at least right at this stage. It's still early. But right now "Roma" is being talked about as a serious Oscar contender. GARSD: Will this bring Netflix a best picture Oscar? Scott Feinberg from The Hollywood Reporter says times are changing. FEINBERG: The reality is we're sort of swimming upstream at this point because people are increasingly consuming movies in other ways thanks not only to Netflix but primarily to Netflix. You know, people love the convenience of being able to click a few buttons and watch from their couch. GARSD: But for the moment, the way to win that best picture is still to show it on the big screen. Jasmine Garsd, NPR News, New York. CORNISH: And we should note that Netflix is an underwriter of NPR. (SOUNDBITE OF STEPHANE WREMBEL TRIO'S "BIG BROTHER") Transcript provided by NPR, Copyright NPR.